Apple has released iTunes 10.2.2. This latest update addresses a few synchronization issues and bugs with the iPhone and iPad. 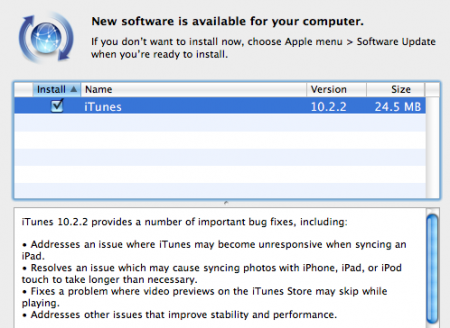 â€¢ Addresses an issue where iTunes may become unresponsive when syncing an iPad. â€¢ Resolves an issue which may cause syncing photos with iPhone, iPad, or iPod touch to take longer than necessary. â€¢ Fixes a problem where video previews on the iTunes Store may skip while playing. â€¢ Addresses other issues that improve stability and performance. Or you can download the update from Apple’s website: iTunes. 64-bit Windows users should download this version.